Would you be surprised to know that your dog is classed as a senior when they reach half of their life expectancy? For large breeds this is 6 years old and for smaller breeds around age 9. One of the most important things for your senior dog is ensuring you are getting the best senior dog food to help keep them active, fit and healthy. As they say, you are what you eat, and this is also true for our canine companions. Just like puppies have different nutritional needs to adult dogs – the aging dog does too. So, what food should you be feeding to your senior dog? Based on our reviews, we would choose Orijen Dry as the best dog food for senior dogs. This food has the highest protein content, which is crucial in our aging pets. It also has low-glycemic carbohydrates which cause lower and slower rises in blood sugar – important for any pets with diabetes. The nutrient profile also helps to keep weight down which is crucial for the aging bones and joints of our pets. Our #1 choice for senior dog food rich in protein. Our choice for senior dogs with joint problems. Our choice for senior dogs with sensitive stomachs. Our choice for toy and small dog breeds. Our favorite wet dog food for senior dogs. One of the best wet dog foods with a balanced nutritional profile. Each dog is different, which means their nutritional requirements are totally unique to them. However, we do know that as dogs age, in general, their energy requirements reduce, they tend to gain fat and lose muscle mass. For this reason, most senior dog food has a reduced calorie content with a higher protein content. Reduced protein contributes to muscle loss meaning your senior dog will get weaker and they may be reluctant to jump or climb. It’s a no brainer really, the best dog food for senior dogs must contain a good % of protein from a good source. The protein requirements for an adult dog are 2.62g per kg of body weight. Senior foods will likely have a much higher protein content. To understand if the dog food contains what you want it to, read the label. Look at the ingredients list first and then the analysis section. The ingredients should be listed in descending order by predominance of weight. Ideally, the first ingredient should be a quality protein source – an animal meat. Check the nutritional adequacy statement, it will tell you what pet the food is for, for what life stage and how much to feed. Any dog food which doesn’t have a nutritional adequacy statement and nutrient guaranteed analysis should be avoided. Feeds which list ingredients should list an animal meat first with a guaranteed analysis of protein with over 20%. 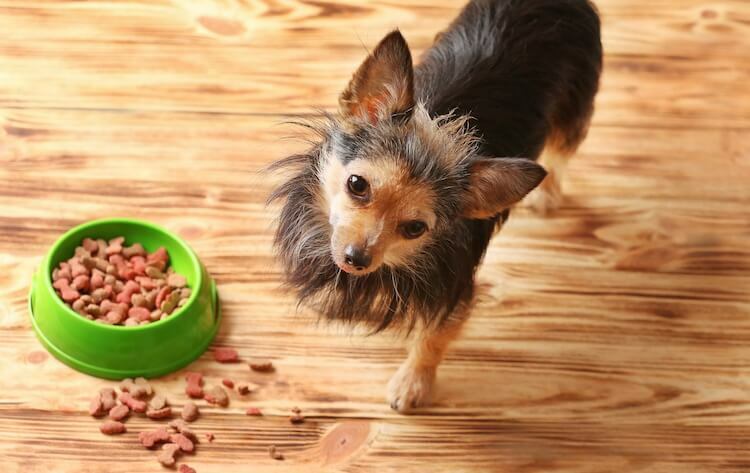 The ingredients found in dog food should provide protein, fat and carbohydrate sources. If the ingredients listed on the label don’t reflect those suggested above, you should avoid the food. It’s best to avoid any dog food with any of these ingredients listed. For senior dogs with kidney disease, or dog breeds which are likely to develop the condition, low phosphorus content has been known to be beneficial. Dogs suffering with heart disease or high blood pressure can benefit from a low sodium food. If your pooch suffers with intestinal issues, a high fiber food may suit them best. For dogs with arthritis or joint issues you may explore foods which contain glucosamine and/or chondroitin. The calorie content in senior food will often be lower than a typical adult food, this is because older pets often slow down. Make sure you maintain the same feeding schedule when introducing a new food. Watch for any digestive discomfort like loose stools or vomiting. You may have introduced the dog food too quickly. If the discomfort persists, the food simply may not suit your dog. Get back to the drawing board and source a new dog food. Choose an appropriate bowl for your older pooch, grippy bottomed bowls are a great addition – it stops them having to chase their bowl around the room. For large breeds you may also consider a raised bowl. It can just make it a little more comfortable for them. If you do select a dog food for senior dogs, but, you have other dogs on puppy food, they can get into each other’s foods. It can be best to feed dogs separately, you can keep tabs on who is eating what and how much they are eating. 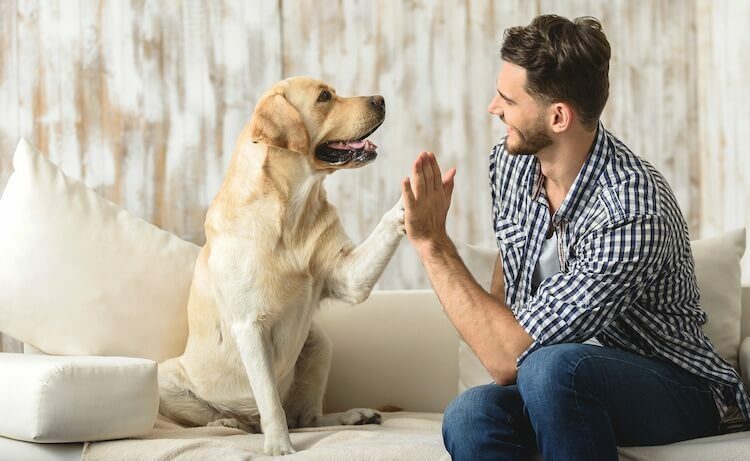 Wet can be more appetizing for fussy eaters, but, you do have storage issues if your dog doesn’t use a whole can in one sitting – wet dog food spoils quite quickly. Dry has a good shelf life and is easier to store. However, kibble can be more difficult for older pets to eat, especially if they are having more and more dental work. Dry is generally more cost effective, however. Raw is the most controversial. Ready-prepared raw meals give you the best opportunity of meeting the needs of your older pooch. It requires a little more organization and discipline to remember to take it out of the freezer. Stick to at least two feeds per day. Feeding the evening meal relatively early gives plenty of time before bedtime incase your pooch needs to go potty. It is thought that it takes around 6-8 hours for food to transport around a dog’s digestive system. Excess protein is simply excreted from the body, so if you are feeding a high protein food you may notice changes in their bowel movements. This isn’t usually anything to worry about but speak with your veterinarian if you become concerned. The label on your dog’s food will normally have feeding guidelines based on weight. For a neutered Labrador weighing 65 pounds. But as we’ve mentioned, older dogs are prone to weight gain due to their reduced activity. Monitor his weight, and if you need to reduce his calories, do so. A great choice of senior dog food for small breeds. A great choice for larger senior dogs over 55lb in weight. A great choice for senior dogs with sensitive stomachs. Senior dog food is specifically created to meet the nutritional needs of older dogs; a higher protein requirement and lower calorie need. It often has additional supplements like chondroitin and glucosamine to support aging bones and joints. When Should You Feed a Dog Senior Food? Your dog becomes a senior at around half of their life expectancy. This can range from 6-9 years old depending on breed size. Senior dog food provides for the different nutritional requirements as your pet ages. Will Senior Dog Food Hurt A Young Dog? Whilst this food is unlikely to hurt a younger dog, senior dog food won’t necessarily meet their nutritional requirements. Also, high protein levels can cause rapid growth in young large breeds, which can be detrimental to their skeletal development. Puppies need puppy food, adults need adult food and seniors should be eating senior food. Best Senior Dog Food For Weight Gain? Providing you rule out any health issue, loss of muscle mass is normal in an aging pet. A protein rich diet is essential in building muscle again. Our reccomended food is Wellness Core Senior Dog Food boasting a 32% protein content – this will support muscle growth, repair and function. What Is The Best Thing To Feed An Old Dog? A high-quality food with appropriate protein, fat and carbohydrate levels. Senior dog foods are specifically formulated to meet increased protein needs whilst accommodating for their lower caloric need. It will also often contain a range of supplements to support the health of the aging dog. When your dog reaches his senior years will vary based on his breed and size – his genetics, environment and previous nutrition will all have an impact on his fitness and wellbeing. For smaller dog breeds you will start to feed senior dog food from around age 9 or 10 and for a large breed this can be as early as 6 or 7. A higher protein dog food will keep his muscles, bones and joints and immune system fighting fit. A lower caloric content will help him stave off those unwanted pounds when he’s less mobile. If he has any existing health conditions, speak with your veterinarian to see if any supplements or vitamins and minerals can have an impact – either positive or negative. We hope our complete guide has given you a good place to start, let us know your thoughts below.